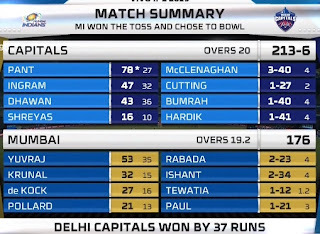 Delhi Capitals Register the first Win against Strong IPL team Mumbai Indians. Rishab Pant 78 from 27 balls Made difference of both Sides. Batting First Delhi Scored Massive Score Put on the board for Mumbai Indians. They Made 213 Runs for 6 Wickets. Dashing Batting by Rishab Pant in the death overs, he took over the game from Mumbai Indians. He Hit 7 Sixes and 7 Fours. 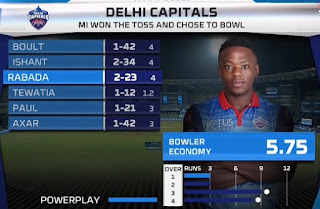 Colin Ingram Made 47 Runs and Dhawan 43. 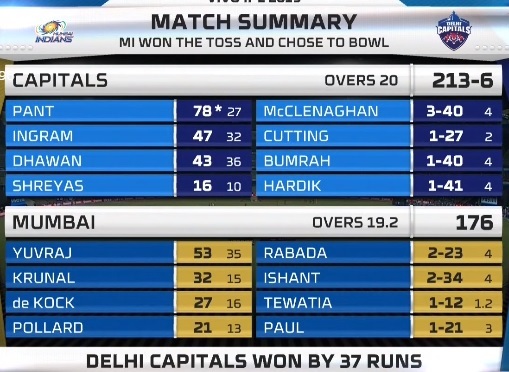 Chasing the Huge Target 213 Runs, the start was not good for Mumbai Indians. Captain Rohit Sharma and D Kock Went Quickly. They Lost 3 Wickets for 45 Runs. Yuvraj Singh Make his Half Century in the Middle Scoring 53 in 35 Balls with big 3 huge Sixes. They Couldnt Reach the Target.They were all out for 176 Runs in the 19.2 overs. Yuvraj Singh 53 in Balls.